In this lesson we’re going to look at cadences – a very important subject in music composition. Most discussions on this topic are brief so today we’re going to look at all the important detail. We’ll learn what they are, where to use them, how they work and how to recognise them by ear. What are cadences in music? Cadences are where the harmony, rhythm, melody and other musical aspects come together to produce a sense of arrival in the music. The arrival can be a dramatic moment, a simple end of phrase and anything in between. Whether big or small, the cadence is a sense that the music reached its destination. Let’s look at some examples to see what this actually means. 1. Not every cadence is a moment of rest. 2. A cadence is not necessarily the very last 2 notes of its phrase. 3. Not every V – I progression (or I – V) is a cadence. Does the cadence give you the sense that the music has finished? Or does it give you the sense that more is coming? The examples above come from different styles so how is it that they all work so well? They work because despite their differences, they have something in common and it is fundamental: it’s their sense of direction. In all of music, whether it’s a classical waltz, a church hymn or a rock song, there’s a sense of moving forward. The question is: What are we moving forward towards? Well, we’re moving towards the cadence! The cadence is the musical goal and every phrase has one. Musically, cadences can be either ‘open’ or ‘closed’ and as we’ll see, combining these two kinds of cadences produces larger sections of music. Out of the examples above, the first cadence is always of the open type while the second one is always of the closed type. The open cadences invites the continuation into the next phrase, which in turn ends in a closed cadence. Think of them just like the commas (,) and full stops (.) in everyday sentences. Like the comma, the open cadence invites a continuation. Like the full stop, the closed cadence ends a sentence. Go back to them and listen carefully, do you get the same impressions of ‘closed’ and ‘open’? As we discuss these cadences in detail, you will notice that in some way all but one involve the dominant chord (the chord built on the fifth degree of the scale). The reason is that the sound of this chord naturally sets up an expectation for the tonic. Listeners may not be aware of it but whenever they hear the dominant chord, they expect it to resolve ‘home’ on the tonic. It’s ingrained in our culture and in our psychology. A simple tune ending on the dominant. A simple tune ending on an extended dominant. But when the tonic finally arrives, we get a resolution – the music is at its conclusion. With the dominant chord resolving on the tonic, the music is at rest. These chord progression formulas (the harmonic cadences) aren’t any different than our little experiment here. They manipulate the listener’s experience by using the dominant chord in a variety of ways. The authentic cadence consists of the chord progression V – I and it conveys a sense of finality, of conclusion. This is because the expectation for the tonic (that was just set up by the dominant chord) is satisfied immediately. So a chord progression that ends with the chords V – I gives us a feeling of conclusion. This is a closed type of cadence. The plagal cadence consists of the chord progression IV – I and it also conveys a sense of finality. Traditionally, this cadence was used for the word “Amen” at the end of hymns. In this case, it usually followed an authentic cadence and because of this, some authors claim that this is not a cadence in its own right but an extension of the authentic cadence. Any cadence that ends on the dominant chord is known as a Half Cadence. The most common examples are ii – V, I – V and IV – V.
As we’ve already seen, the dominant creates the expectation of a resolution on the tonic. So when a phrase ends on the dominant the resolution is not satisfied (or at least, not yet). Not reaching the tonic creates a sense that despite the end of phrase, the music is about to go on (and it often does so starting with the tonic). A chord progression that ends on the V chord creates a wanting for some sort of continuation and so this an open type of cadence. Like the authentic cadence, the deceptive cadence begins on the dominant but instead of tonic, it resolves on a different chord – very often the submediant (vi). The ‘deception’ occurs in that the dominant resolves on the tonic note but not the tonic chord. In other words, in the deceptive cadence, a different chord harmonizes the tonic note. Usually it’s the submediant (vi) but sometimes it’s other chords, such as the subdominant (IV). While the harmony is essential to the sense of arrival in a musical phrase, it doesn’t work on its own. Other musical elements, especially melody and rhythm, also have their roles in producing cadences. And the sense of finality is even weaker when the fifth of the tonic is on the top the tonic chord. The top note of the final chord affects the sense of finality of the cadence. Apart from the chords and the top melody, the musical effect of a cadence also depends on whether its final chord occurs on a strong beat or a weak beat. Here is an example from Bizet’s Farandole from L’ Arlessiene Suite 2. The 2 phrases here end on the tonic D but the second one is more final just because it ends on the strong beat. And to add to our possibilities, even the inversions of the chords themselves have a significant impact on the effect of a cadence. The sense of conclusion of the authentic cadence is strongest when both chords are in root position (with the roots of the chords in the bass). With all these possible varieties in chords, rhythm and melody, we have a whole spectrum of cadences ranging from completely closed to completely open and everything in between. Phrases that finish with a sense of a temporary repose (the deceptive cadence). What’s really interesting is that we can combine different kinds of phrases to produce larger sections of music, typically known as ‘periods’. A period is 2 or more phrases that belong together much like a paragraph in English consists of a variety of phrases and sentences. The last cadence of a period is the strongest cadence of the group (and this is what brings the period to an end). Phrases tend to come in groups, most usually in groups of 2, 3 and 4 but sometimes more. Notice that in all examples, the last one is always the strongest so it brings the section to a conclusion. Here’s an example of a 2-phrase period. The first cadence is a half cadence followed by a phrase that ends in an authentic cadence. And here is an example of a 4 phrase structure. Just like the other examples, the last cadence is the strongest and it brings the section to a close. Now that we learned some detail about what cadences are and how to use them, I’d like to address 3 common misconceptions. If you have come across one or more of these inaccuracies in your studies, we’ll clarify them here. There is a common misunderstanding amongst students that a cadence must end with a long note or a sense of relaxation. This is not so. While many cadences do end with a long note, it is not a necessity and many cadences do not. In this example from Bach’s first Cello Suite, there is no rest or long notes between phrases. The music simply keeps going with short notes that lead smoothly to the next phrase. Longer notes are reserved for later in the piece. There are many instances where a few notes round off the phrase after the actual cadence already occurred. This happens very often at the end of a piece or a song. 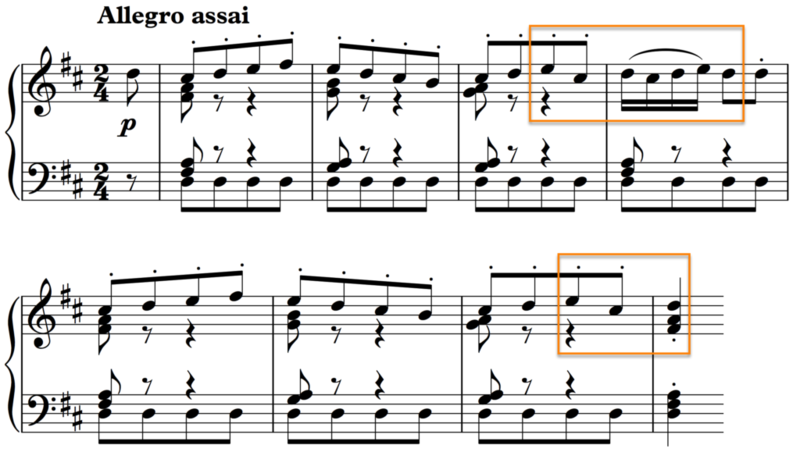 In this example, also from the Bach’s first cello suite, the bar is filled with notes rounding off the phrase after the cadence has already occurred. Bach does this because the melody still has a lot of momentum as it comes into the cadence. Rather than end abruptly, the music tapers off. It’s like a marathon runner sprinting towards the finish line. Having reached the finish line, the runner cannot just stop moving at once. She slows down and gradually comes to a stop. A phrase can be full of tonic and dominant chords but it can only have one cadence. 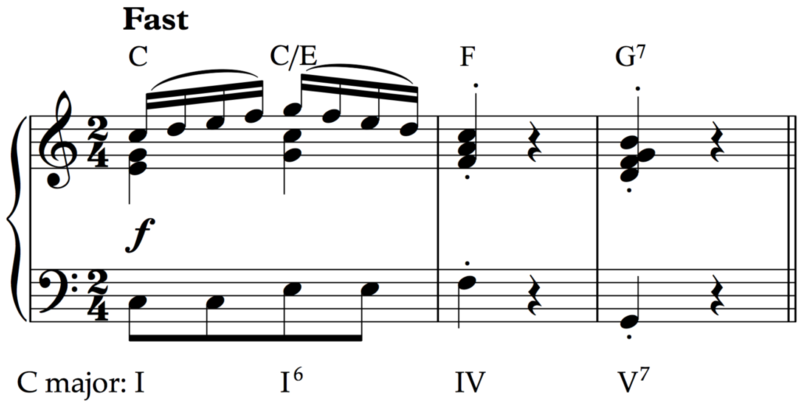 If every V – I progression was a cadence, these 2 bars and a bit would have 4 of them. Clearly, this is not so even though they only consist of the tonic and dominant chords. A common question from students new to composition is how to find cadences in the music. To the inexperienced eye and ear, a written piece of music can look like a bunch of dots without any clear organization. But I assure you that with a little bit of guidance and practice, it’s not that hard. Listen to the natural breaks in the music. Much like in everyday language, a phrase is normally uttered in one breath after which there is a pause or a break. The pause can be long or short but it’s always there. If there are lyrics sung with the melody, then a musical phrase is usually as long as a verse or a sentence. Look for patterns. A repetition of a few bars is often a signal that a new phrase has begun. Number the bars starting from the first full bar (upbeats don’t count as the first bar). Typically, phrases are 4 to 8 bars long and phrases that are grouped together are the same length. A phrase in a slow tempo will take fewer bars and a phrase in a fast tempo will take more so look at the tempo marking. Typically, all the phrases begin on the same spot of the bar. So if the first phrase begins on an upbeat, the next one will do so too. Not every long note is a cadence and not every cadence is a long note. This is one of the misconceptions we spoke about earlier. 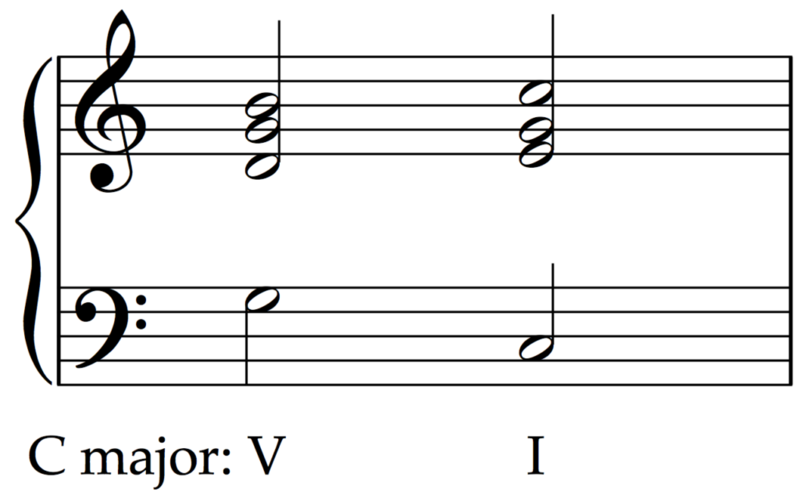 While some cadences are long notes, there are also plenty of examples of cadential short notes. It should be clear by now that cadences are essential because they are what allows the listener to make sense out of music. Every musical phrase begins a short journey towards its cadence and once there, the cadences itself hints at what’s coming next. The next phrase, then, begins its own journey towards another cadence and so on and so forth the music unfolds bit by bit. In this sense, music is like a collection of mini-journeys that combine into one long expedition. It’s also in this way that cadences act like the punctuation of everyday language. If you consider any long paragraph of text, you’ll see that it consists of phrases and sentences. What is it that separates phrases and sentences from each other? Or to put it in other words, what is it that organizes words into phrases and sentences? It’s the punctuation! The full stops, commas, question marks, exclamation marks, hyphens and so on organize words into phrases, sentences and paragraphs. Cadences have the same role in music and this is why they are so significant in musical composition. Another common question is how to identify the four common harmonic cadences by ear. As with so many things in music, it takes a little bit of daily practice but here are a few tricks to get you started. Out of these four harmonic cadences, the plagal cadence is the only one without a dominant chord but it still has a sense of conclusion. Often you will hear a common tone between the two chords. The half cadence ends on the dominant meaning that it ends with a strong urge to go to tonic. Listen to the impression of the music wanting to go on, a sense of needing a resolution. As we’ve seen, the deceptive cadence begins on the dominant but resolves on a chord other than the tonic. Since it usually ends on the submediant chord, this cadence ends on a minor chord and it’s the only one to do so. Listen also to how the bass moves by step up in this cadence.